The video game publisher's share price has climbed more than 480% over the last five years. Electronic Arts (NASDAQ:EA) stock gained 11% in May, according to data provided S&P Global Market Intelligence . Shares climbed early in the month following news that the video game publisher would soon unveil the next installment in its Battlefield franchise and then saw an even bigger pop following strong quarterly results. EA published its fourth-quarter and full-year results after market close on May 9, delivering sales and earnings that each topped the average analyst estimate. Sales for the period came in at $1.58 billion while the average analyst estimate guided for sales of $1.24 billion. Revenue for the March-ended quarter was up just 3.6% year over year, but digital sales for the period were up 18%. That's significant because digitally delivered sales tend to be higher margin than retail sales. 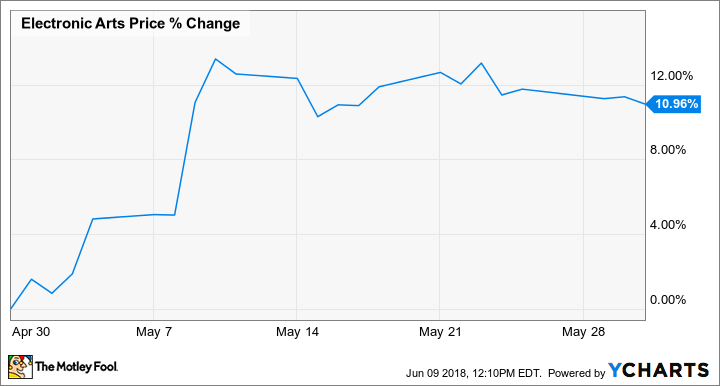 This helped push earnings per share for the quarter up roughly 7.8% to $1.95, well above the average analyst estimate's call for earnings of $1.83. EA is registering strong engagement across its core properties, with the number of combined players engaged in competitive matches in its FIFA 18 and Madden NFL 18 games rising 75% compared to the previous year's installments to reach roughly 18 million. More engagement points to more in-game spending, so EA still has avenues to strong earnings growth if it continues to deliver content that delights players. The company recently showcased some of its big upcoming games in the lead-up to the E3 gaming industry expo, and looks to have a solid lineup of titles set for release in the near future that will help it continue to take advantage of industry trends like growth for digital distribution and in-game content sales. Taking a more long-term vantage, EA also appears to be in good position to benefit from increasing interest in esports and mixed-reality platforms.